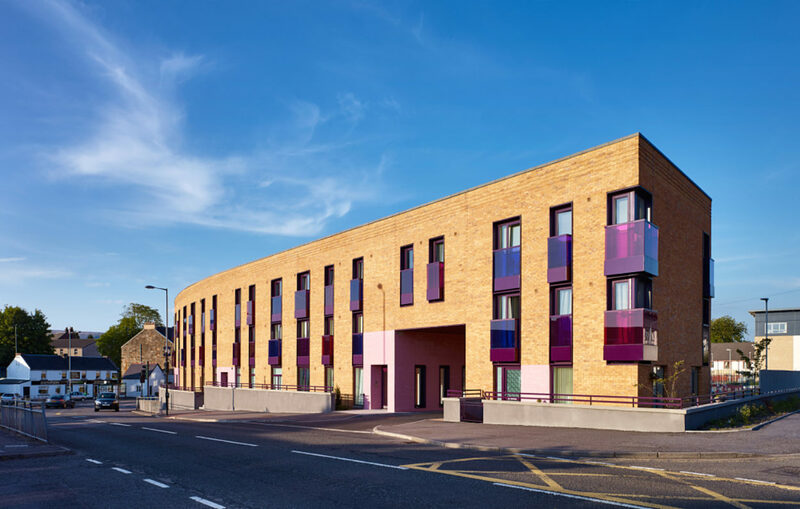 The development for East Dunbartonshire Council and Sanctuary Scotland comprises of 17 new build flats and a corner retail unit, within in a three-storey development. A three-storey form is adopted to tie in with the scale of the neighboring properties. A curved elevation is created to continue the established street frontage from Townhead Cross. Townhead Cross to the North of the site is a strong urban feature with distinctive and clearly defined edges. The crossroad is traditionally a major nodal point and the building scale reflects this. Orientation and navigation is aided by continuing the line of shop frontages from Townhead Cross along Lenzie Road to Saramego Street. A vista is created as the facing brick elevation curves to follow the line of the road. The refurbishment of the “Co-operative Clock” feature also serves as a distinctive landmark to aid navigation. Brick is the predominant elevational material and careful specification has enabled the brick to blend the surface to be reminiscent of the variation and solidity of traditional sandstone buildings in the area. To boldly highlight and contrast the predominant brick elevations a feature glazed pink brick has been used around the close entrances and pend access providing interest and durability at the same time. The coloured glass balconies to street elevation continue with the pink brick theme and provide a rhythm and playfulness to the street elevation through colour variation and projection which, at nighttime, become illuminated by each flat. 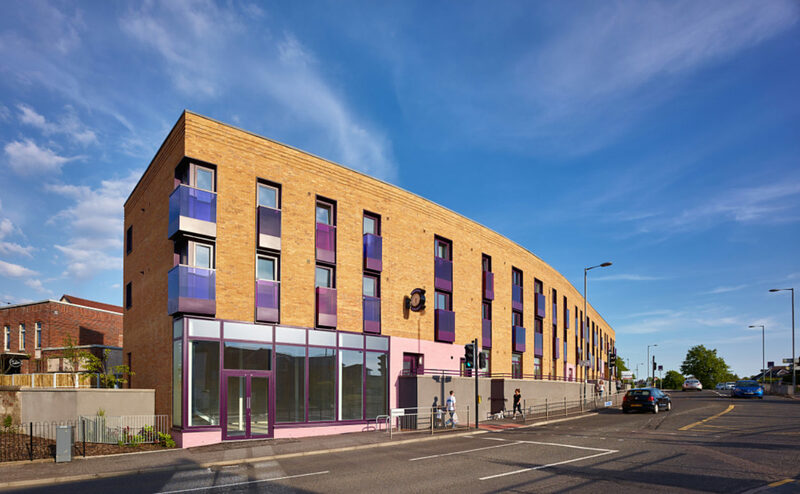 At the same time the window scale and uniformity give the building a sense of place making aligned with the prominence of the site location on Lenzie road. The site is laid out on a North/ South axis. Internal layouts are designed specifically to respond to the sun path with large glazing elements to provide passive solar gains to reduce heating requirements. The timber kit construction has been carefully layered for improved thermal efficiency. A smaller timber stud frame has been chosen over the more conventional kit and then wrapped with insulation externally within the cavity, and also internally. This significantly reduces the thermal bridging elements of the timber kit and has also been coupled with an extremely good level of airtightness to reduce ventilation losses. All materials have been considered for durability, reduced life cycle maintenance and reduced CO2 generation.